If you love Thai food, this Thai Coconut Chicken is for you! The chicken is marinated in coconut milk loaded with Thai flavours which adds flavour and richness to the chicken. 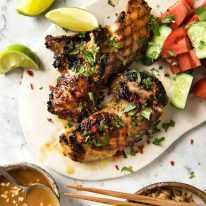 Served with a Peanut Coconut Sauce to really drive home the coconut flavour, this Thai Chicken is fantastic for the BBQ, stovetop or roasting. Serve this with a side of Thai Fried Rice! If you’re new to coconut marinades, you’re going to really love this Coconut Chicken recipe! 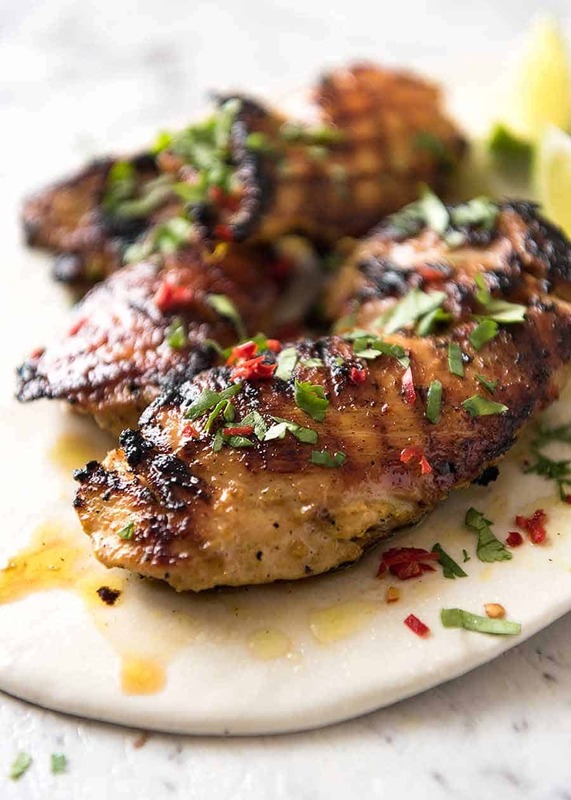 Coconut milk is a brilliant marinade – it’s a flavour carrier, infusing the chicken with all the tasty flavours you’ve mixed into the marinade. But not only that, it also adds richness into the chicken, which most marinades do not do. 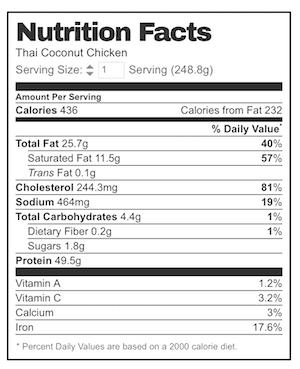 Coconut milk has a fair amount of fat in it which infuses into the chicken. 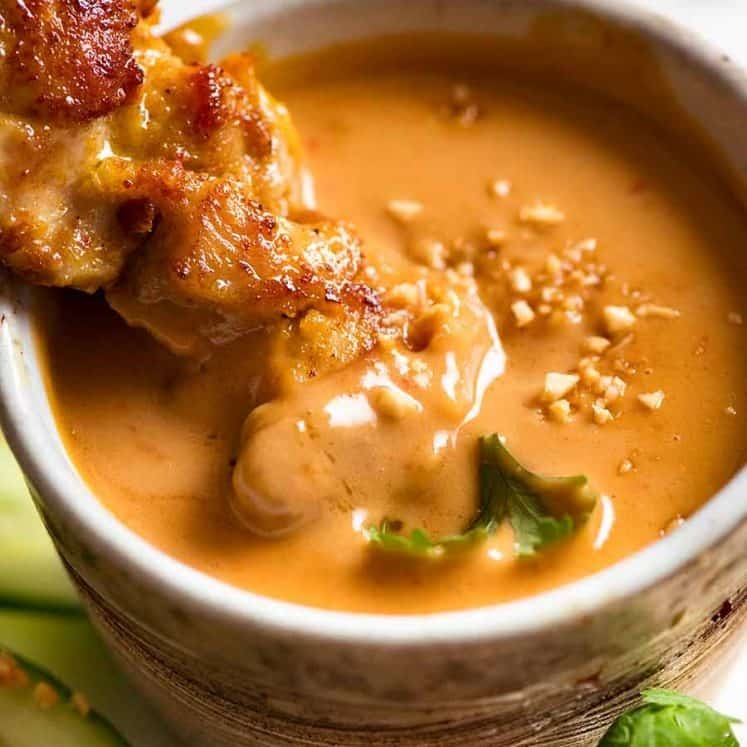 So this Thai Chicken is not only injected with terrific Thai flavours, it’s tenderised and infused with what I describe as “butteriness” from the coconut milk. It’s absolutely divine! 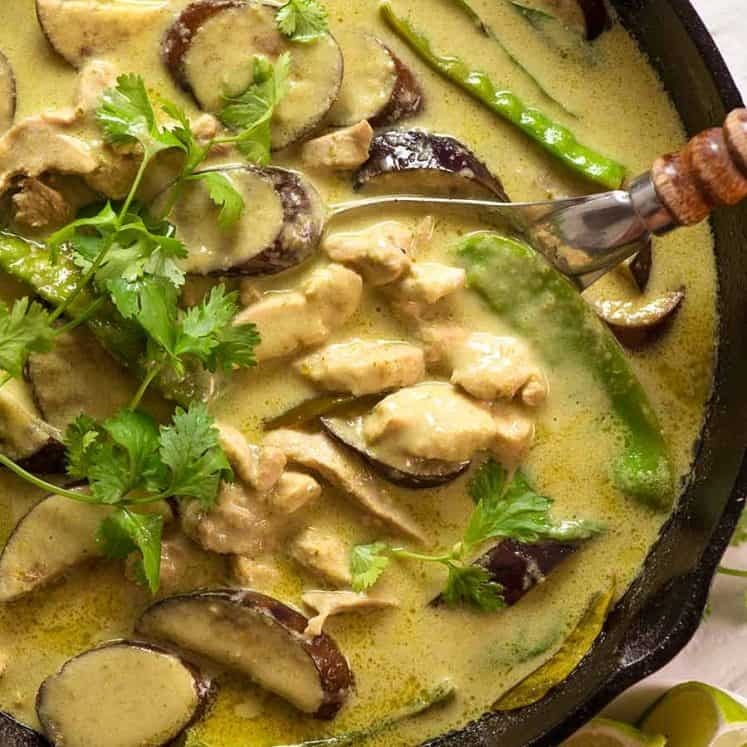 While this Thai Coconut Chicken may not be strictly authentic Thai, the marinade is loaded with authentic Thai ingredients that are found in classic Thai recipes, like homemade Thai Red Curry and Thai Green Curry Pastes. 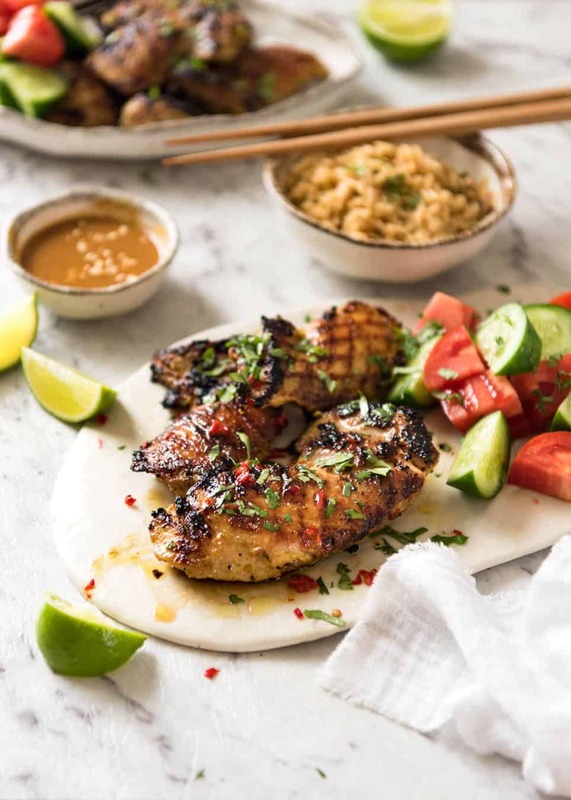 It also just dawned on me that the ingredients in the Thai coconut marinade is like a mash up between this incredible Southern Thai Tumeric Chicken and Gai Yang, the popular Thai grilled chicken which is a street food favourite. 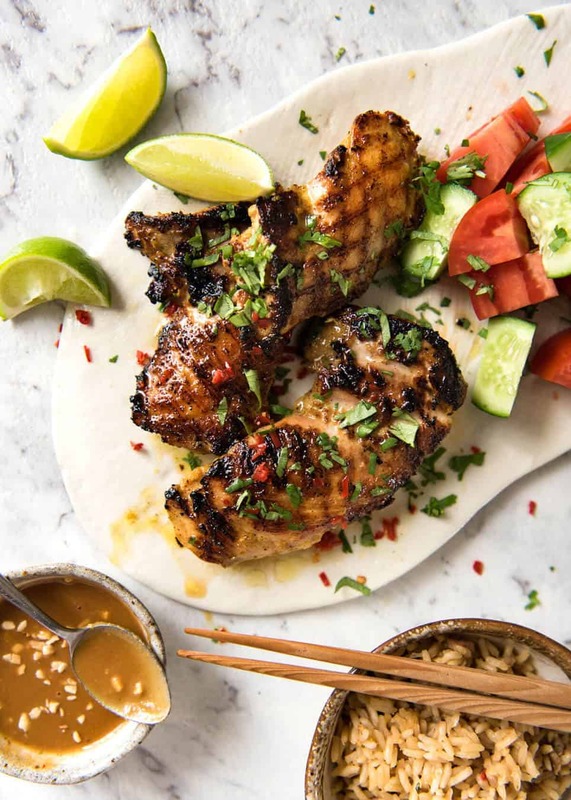 The coconut flavour from coconut marinades is actually quite subtle, like in this western style Coconut Marinated Chicken. 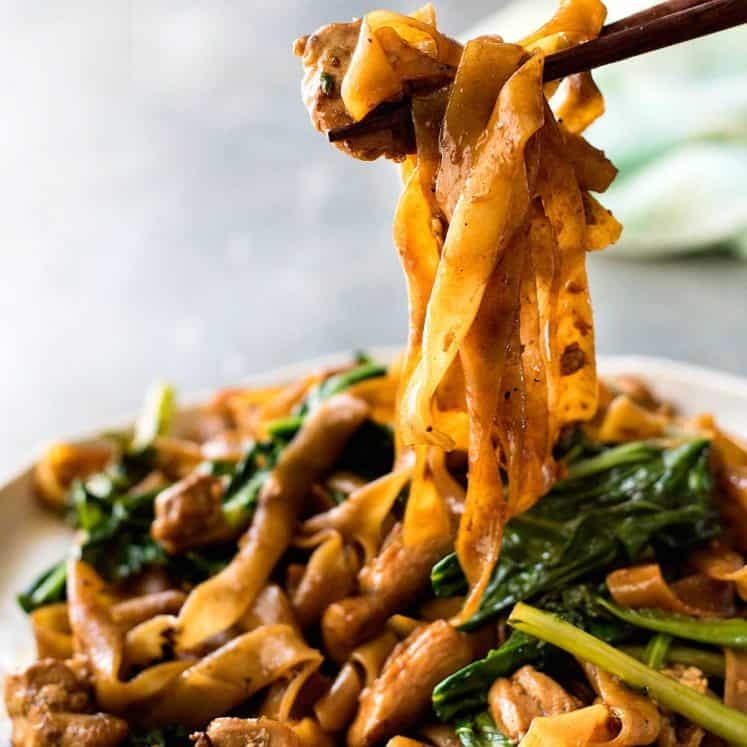 Also, it’s quite a neat way to use up a whole can of coconut milk in this recipe – because despite good intentions, I never seem to use up leftover coconut milk! serve with plain slices of tomato and cucumber (pictured) -this is a very common way vegetables are added to a meal in Thailand. If you love cooking with coconut milk, you’ll love these! Recipe video above. Chicken infused in a gorgeous Thai coconut marinade which infuses with flavour and adds buttery richness from the coconut milk. MARINATING TIME: 24 - 48 hours. Mix marinade in a large bowl. Add chicken and mix. Cover with cling wrap and marinate in the fridge for 24 - 48 hours (can't skip marinating for this recipe). Brush BBQ with oil, or heat 1 tbsp in a skillet (I used a skillet). Use Medium heat - or Medium Low if your stove/BBQ runs hot (otherwise marinade may burn). Remove chicken from marinade, shaking off excess. Cook the first side for around 5 minutes or until caramelised and golden. Turn then cook the other side for 4 minutes until caramelised. Transfer chicken to serving plate, cover loosely with foil and rest for 5 minutes. Garnish with coriander / chilli if desired, and serve with lime wedges and Sauce. Place ingredients in a bowl and mix a bit. Microwave for 30 seconds, then mix until smooth. Bring to room temperature or serve warm (it thickens a bit when cooled). 1. Marinade - best made with fresh ginger, garlic, chilli and lemongrass but it is still terrific using store bought jarred garlic etc. Lemongrass is sold in tubes in the fresh produce section of Australian supermarkets and it is actually very good. I would use 1 1/2 teaspoons if using paste. 2. Chilli - use any fresh chilli you want. Rule of thumb - the smaller the chilli, the spicier it is! I used large red chillis in this (cayenne peppers) which are not that hot. Thai Chillies are super spicy, as are Birds Eye Chillies. 3. Lemongrass - If using fresh lemongrass, peel the green reedy outer layer off to reveal the white part. Then finely chop the white part only. 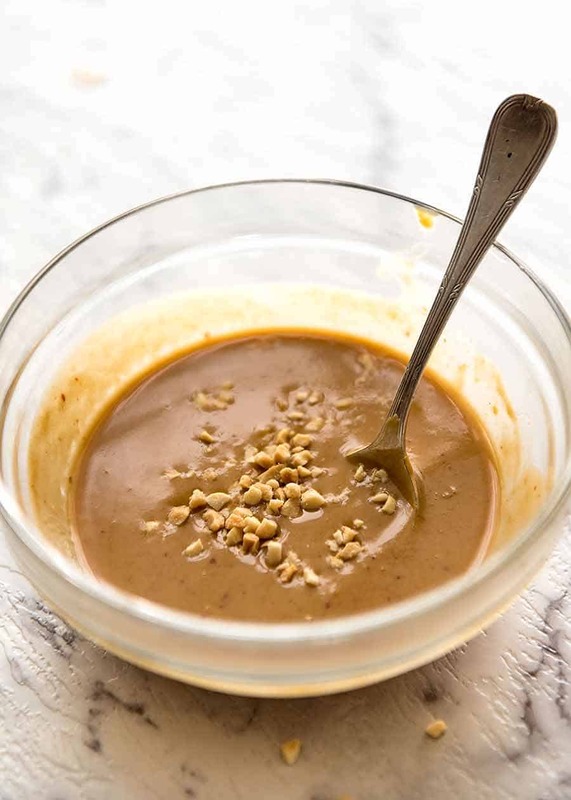 You can also use lemongrass paste. Use 2 teaspoons. 4. Chicken - This recipe works best with chicken cuts with fat. Boneless thigh is my favourite. It is fantastic with drumsticks and other bone in cuts, but it is better to roast rather than cook on BBQ (marinade has tendency to burn and these take longer to cook). Roast drumsticks and wings for 45 min @ 180C/350F, bone in thighs for 50 min - it caramelises nicely. 5. Serving suggestions - see in post for sides. 6. STANDBY / FREEZING: Once you put the chicken in the marinade, pop it in the freezer. I find that the time it takes for the chicken to freeze then defrost = good marinating time, plus you can also leave it for a further 24 hours after defrosting. Ensure it is defrosted before cooking. 7. 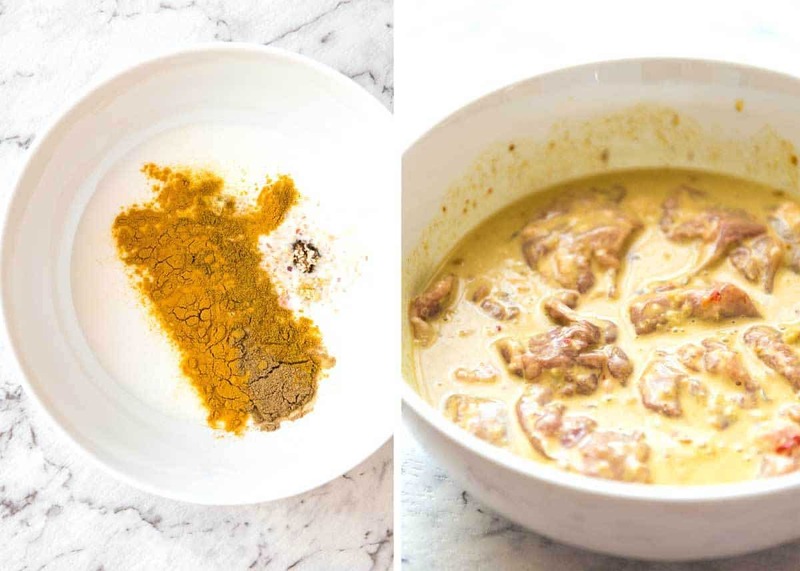 Nutrition assumes 5 servings, 1 kg/2lb chicken, accounts for 1/4 cup coconut milk in the marinade (rest is discarded) and that all the sauce is consumed. Currently overseas with friends in Fiji. 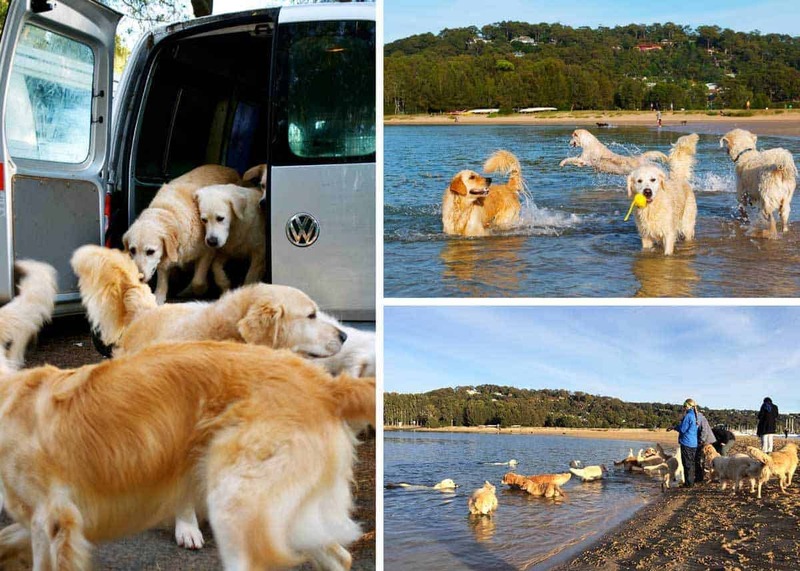 As usual when I’m away, Dozer is on his own holiday with the golden retriever boarder. His second favourite person in the whole world (only after me – I think 🤔), he has much more respect for her than me. 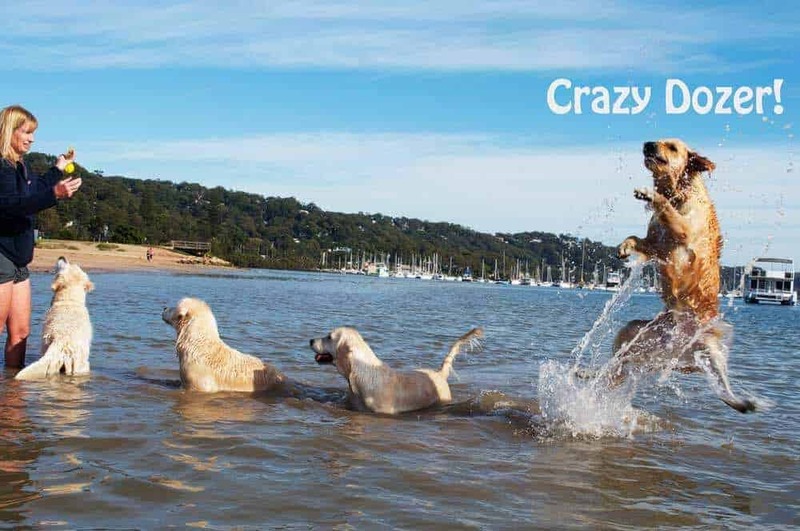 She’s also great for getting dogs in shape – it’s like a Biggest Loser Boot Camp. Not that Dozer needs to lose weight now. But when I (accidentally) made him a bit tubby when he was younger, I boarded him with her and when I got back, he was a lean, mean, fighting machine!!! Ba ha ha!!! Amazing! One of my favourite chicken marinades. I used breast and followed your cooking instructions, was still juicy and delicious! Served it with coconut lime rice and shredded green cabbage . Oh I also used soy sauce instead of fish sauce, my husband freaks out about the smell everytime. Thanks Nagi! I’m so confused about the curry powder you list in the ingredients. There are soo many different curry powders and I’m not sure what to use here. I don’t think my indian style curry powder will complement the thai flavours. What curry powder do you use in this recipe? I knew you’d posted something about Fiji. BULA Nagi! Just returned from Denarau after 9 days. Didn’t do too much BUT I hope when you were in Fiji you had the opportunity to visit the local markets in Nadi and Lautoka. The local spices, herbs, fruit & vege and how they’re sold is probably my highlight. The locals are just so lovely and very willing to discuss their products – a foodies delight indeed. The aroma is something I don’t think I’ll ever forget, you could spend all day taking it in. We booked a suite at the Hilton which included a kitchen (stove, microwave, utensils, dishwasher etc) + a BBQ so I was able to cook using local produce. I made this dish tonight and my partner said it was the best thing his eaten in 2018 even better then restaurant food! I added steamed carrot just so there was some veg in our dinner but all in all such an amazing and easy dish! Soooo looking forward to trying this. A quick one: its almost next to impossible to get lemon grass where I live. Any ideas on what I can use as a good substitute without ruining the dish? Thanks! I made this up in August and took out of the freezer yesterday morning. We had it for dinner last night. Oh my, it was so delicious and so tender. I didn’t have any hoisin which I thought I did for the sauce so I replaced with with oyster and a teaspoon of honey. Looking forward to making it again with hoisin. I served it with the Thai Fried Rice, again delicious. I thought there would be leftovers for tonight but everyone kept going back for seconds, then thirds!!!!! It was so good having it all made up in freezer. I’m going to do that with more of your dishes. I was talking about you and your recipes last week whilst swimming in the lovely warm waters in Waikiki whilst on holidays with a friend who directed me to you last year. We both agreed that you are simply the best and your recipes never ever disappoint, so thank you Nagi! Why is it that this takes 24 to 48 hours marinade and the other thai chcken is overnight up to 24 hours? Is it the thicknes of the coconut milk the difference? I have a chicken wings competition this Saturday at a pool party and i need to inpress 😊 which one do you raccomend? I made this yesterday and found that I’m really not a fan of the fish sauce flavor (all else tastes great). Any suggestions on what I could sub for this? Thanks you. I’ll use the soy sauce next time. It could just be the brand I bought – it also had a strong smell. I used 2 tablespoons. Can I fridge the marinaded fresh chicken thighs in a clipseal bag for 48hrs then freeze the bag until I would like to defrost and grill ?? Would love to have some on standby !! Hi Kym! I think the better way would be to pop it in the freezer as soon as you put the chicken in the marinade – you’ll find that the defrosting time is the perfect marinating time for this! N x PS I’ve updated the recipe with these directions. Nagi, do you think this would be OK cooked as skewers with tenderloins or would they cook too quickly and be dry? I’m looking for finger food for a BBQ and this looks super tasty. Oh my goodness Nagi! This looks amazing and I’m trying it soon! You know how to push all my buttons, and that’s a good thing! Have a wonderful hedonistic vacation with friends and enjoy, enjoy, enjoy!